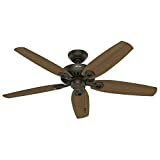 The Westinghouse 7200700 Comet is our best outdoor ceiling fan, which is ideal for 360-square-feet rooms and comes with 3 speeds to choose from. With a double light fixture, it has an airflow of 5,087 cfm and has a frosted glass cover for the light kit. You can choose from espresso, black, pewter and white finishes. Our step-up pick is the Hunter 54098 Bayview and this fan is ideal for sunrooms, patios and porches and can cover up to 485 square feet. It has minimal noise and it has durable plastic blades that can withstand the elements. The motor is reversible for the winter heating process. The budget pick is the Hunter 53292 52-in-Builder and you can place it in your sunroom, patio or porch and it has a powerful air movement but quiet operation due to the motor’s design. It has a reversible feature and it can also be ideal for angled and low height ceilings due to its mounting choices. One of the benefits of installing a ceiling fan at home or in your office/shop is that it does not take a lot of space. The ceiling fan can be beneficial and supportive to your A/C unit and at the same time, take little to no footprint in your room or area. It is a must-have for those who do not have enough room for a stand fan, wall fan or desk fan or even a tower fan. A lot of homes, offices and establishments prefer a ceiling fan not just because of the space saving qualities but also because it circulates air better than desk fans and stand fans. If you want your establishment to save up on energy costs and in operational costs, you can opt for an industrial ceiling fan instead of relying on the air conditioning unit alone. Installing a ceiling fan should be done by an expert, unlike with stand fans and desk fans. It is much like ceiling lighting so it can be complicated. You have to make sure that the ceiling fan is properly mounted up in the ceiling to prevent it from falling down and causing injury to anyone. Therefore, you should get an electrician to do the installation if you are not sure with the ceiling fan. Most people have fear of installing extended downrods for outdoor ceiling fans. Contrary to popular belief, the downrod is not always the source of the wobbling – it’s all in the mounting bracket whether it is securely tightened or not. Blade size: The blades that are longer can potentially be better for larger areas and small areas will be doing just fine with shorter blades, also for safety purposes. Blade material: while wood is okay for indoor use, it might not be suitable for outdoor use or even for larger areas. Most outdoor suitable ceiling fans can be made of plastic (polypropylene), metal (e.g. galvanized steel) or treated wood that is capable of withstanding bad weather. Some are also made of fiberglass. 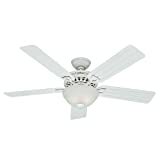 UL rating: a outdoor ceiling fan can either be damp rated or wet rated. This means that it is either meant for damp environments (near the sea, highly humid areas) or for wet environments (rain, snow, ocean and wind). Speed settings: having choices for your ceiling fan should be important and will usually have 3 to 4 speed settings on the average. This is to save the lifespan of the motor in the long run when you use the flush mount ceiling fan. Reverse feature: most outdoor ceiling fans can be reversed like home fans, because they will most likely be needed for the winter as well. If you serve guests in the winter in your patio then it pays to have a reverse feature to help your HVAC or fireplace to warm things up. Light fixture: most outdoor ceiling fans also have lighting fixtures, much like home ceiling fans. The only catch is that it is up to you if you really need the lighting or not. In porches and patios, you may need them at night, especially if you are serving guests outdoors for parties at your backyard. Design: A good outdoor ceiling fan must have a long wearing design that does not easily crack or fade through time and usage. Those with special coating will do the trick for bad weather. Ease of installation: do consider an industrial ceiling fan that is relatively easy to install and simple to put together, especially for those who don’t have a lot of time and budget to install many fans in one go. Warranty policy: make sure you know the warranty policy of your outdoor ceiling fan and the parts should be highly durable so you won’t waste your money on something that isn’t worth it. 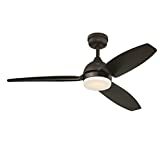 Our best outdoor ceiling fan is the Westinghouse 7200700 Comet because it consumes a good wattage of 56W and it is efficient at 90 cfm per watt. It comes with 2 torpedo bulbs at 40 watts each. It has a downrod that measures 4 inches and comes with a lead wire at 54 inches. With weatherproof blades for outdoor use, it has a quiet motor and can be used for both summer and winter due to the reverse feature. It has 2 years warranty on other parts and a lifetime warranty for the motor. The only cons but not deal breakers to say about the Westinghouse 7200700 Comet include the fact that the washers might not fit easily but you can remedy this by supplying your own set of washers anyway. The Hunter 54098 Bayview is our step-up pick, which has a total of 5 blades and is also damp rated by ETL. It has a gold finish but you can also pick a white finish for it. you can use it for angled or low ceilings as well due to the 3-position mounting system. As an Energy Star rated ceiling fan, it has a pull chain mechanism and is energy efficient. It has a limited lifetime motor warranty. The Hunter 53292 52-in-Builder is our budget pick, which is damp rated by ETL and comes with a pull chain. The blades are made of oak veneer and are distressed in style. These 5 blades are also white washed for added rustic factor. With a variable speed, it is rated for use in 120-volt systems. It can complement any traditional or casual area with its design and it is backed by a limited lifetime motor warranty. 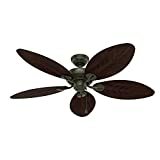 The Casa Delta 52in is a remote controlled ceiling fan that has blades made with a solid walnut finish. The 3 blades are ideal for damp locations and are UL rated. The blades all have a pitch of 9 degrees and you can choose between ivory and brown for the finish. It has a 6-inch downrod. The Emerson CF130ORB Tilo is a damp rated hugger mount fan or flush mount ceiling fan with 3 curved blades and a remote control. You can place a light kit onto this fan and it has 30-inch blades for smaller rooms with a pitch of 18 degrees. The Hunter 53122 Beachcomber includes a light kit and 52-inch blades with a white finish. It is suitable for outdoor use and comes with 2 incandescent light bulbs encased in swirled marble glass. The speed adjustments are easy to switch due to the pull chain. The GE Morgan 54in has a bronze finish and comes with an LED light kit for energy savings, encased in an opal glass shade with a matte finish. It uses SkyPlug technology for ease of installation and mounting. It has a remote control to help you choose between the 3 speeds. The Hunter 54″ Coral is a zinc coated outdoor fan that is reversible for winter use. The mounting system allows 3 positions: low ceiling, angled and standard for various ceiling types. The remote control makes it easy to switch between the speeds and it comes with an LED bulb at 5 watts. The Hampton PalmBeach II has a set of wicker blades for tropical and traditional style outdoor home settings. It has a natural iron finish for the body and measures 48 inches for each blade. It is a wet rated outdoor fan as well. 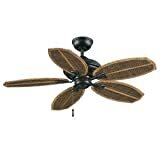 The Hampton Bay Lillycrest is a wet rated fan that has an aged bronze finish and is okay for both indoor and outdoor use. With 52 inch blades, it has a pull chain operation for the speeds and comes with toasted almond finish for each of the blades. 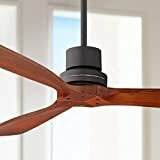 Other outdoor ceiling fans did not live up to our expectations because they were too flimsy on the material for the blades and they were also not UL rated at all. For a ceiling fan to be outdoor rated, it should pass the UL standards and should have an indication if it is meant for damp environments or for wet environments so you can use it on your porch, patio or outdoor setting. Q: What are the differences between indoor ceiling fans and outdoor ceiling fans? An indoor ceiling fan is usually meant only for indoors because they are made of mostly wood materials that are not very good for the outdoors. They are mostly decorative with lights and have pull cords. They don’t have protection against bad weather, corrosion, wind, UV rays and the like, and don’t have a lot of airflow as compared to outdoor ceiling fans. Indoor ceiling fans can be placed on the following areas: bathroom, bedroom, kitchen, living room, dining room, basement, attic, play room, recreational room, classroom, small stockroom, office, restaurant, shop and the like. An outdoor ceiling fan, on the other hand, is meant for both indoors and outdoors because of their resistance to corrosion, UV rays wind, rain, storm, snow and even insects. The powerful airflow makes them versatile for nearly any part of the home or establishment. They can also withstand humidity as well as high heat. The only catch is that they can be a little noisier compared to indoor ceiling fans. Outdoor ceiling fans can be placed on the following areas: patios, porches, decks, sunrooms, terraces, stages, open halls, gardens and other outdoor yards or areas. Q: What are the benefits of choosing an outdoor ceiling fan? • Damp rated means that they are okay for places with high humidity such as near the sea or in tropical areas, such as in patios, porches and sunrooms. • Wet rated means that they are okay for places with snow, rain or storms, or even high winds, such as in larger patios and decks. They are usually silicon sealed. The materials of the blades are durable and are weatherproof. Materials that make up the blade of the ceiling fan that is meant for outdoors can be ABS plastic or treated wood and some are even made with traditional ones like canvas, denim and vinyl. Some are also made of fiberglass materials to make them last longer with better aerodynamics. The blade shape can also have an effect on the blowing power and air circulation of the fan. The housing can also be weatherproof and usually made with a galvanized finish. Most ceiling fans that are meant for outdoors can have a bronze nickel finish while some are coated in a special finish to make them corrosion proof, which is ideal for humid areas near the sea and to withstand rain and storm as well as snow. A sturdy housing for the motor is important to choose to make the motor safe from the elements while outdoors. They can help you ventilate your outdoor space for your guests. Having an outdoor ceiling fan can have an effect in case you and your friends and family are having a little party or chit chat in the patio, porch or deck, and it’s summer. Ventilation is important so that people outdoors can feel at ease even with the summer air, and the outdoor ceiling fan can help blow cool air for everyone. Q: Which is better: a wet rated outdoor ceiling fan or a damp rated outdoor ceiling fan? If a ceiling fan is damp rated, it is only ideal for places that do not get direct contact with rain or snow, such as patios and porches. They can deal with salt air near the ocean so they are good for humid climates in tropical places. Damp rated fans cannot be used under the rain or storm and cannot be used in the snow as well. If a ceiling fan is wet rated, you can use them even on uncovered patios or outdoor areas and they can stand up to the elements. They can withstand the rain or storm and can also stand up to snow. Wet rated fans can be situated anywhere because the housing for the motor and the blades are all very durable and well-sealed. Q: What are the different kinds of ceiling fans according to style and functionality? The chandelier or light kit ceiling fan is a 2-in-1 fan that combines both lighting and fanning solutions in one. It is both a light system and a ceiling fan and can be stylish as well. Some fan have a covered design while some have an open design. It is ideal for those who want to decorate their home and add lighting, whether it is a supplementary light or a main light, along with the cooling benefits. The decorative ceiling fan is usually a uniquely designed fan that is most likely custom made, usually by DIY work or can be bought from certain novelty stores. They can serve as an additional accessory to match the theme of a certain room, such as a recreational room or kid’s bedroom. The decorative ceiling fan may also have lights and can have 2 to 4 blades, and can be made from various materials. The vintage ceiling fan is mostly a decorative fan because of its lack of power compared to modern ceiling fans. 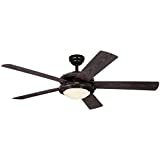 However, they can still add sufficient cooling power in the summer and savings in the winter if you purchase a transitional style vintage ceiling fan that combines a rustic style and a modern motor that is functional overall. They look attractive and at the same time blow some good air around. The belt driven ceiling fan is a variant of the vintage fan, and is usually a cluster of three or more fans that are driven together with belts to make them run simultaneously. If you have a vintage room or a vintage themed restaurant, gallery or area, this is a must-have for your room, since it adds a touch of fanciness. While not a big player in cooling, it adds a lot of style and renaissance feel to a room. The modern ceiling fan, also called the minimalistic ceiling fan, usually has cleaner styles and lines with less details and more straightforward designs. They mostly include a light fixture as well to add to the energy savings and the dual function that most homes are looking for. They look sleek and minimalistic in design and can be situated in most modern homes today. They can also have a decent amount of cooling power and can be either indoor or outdoor. The outdoor ceiling fan is any style of fans mentioned above but are made with materials that make them suitable for outdoor use, such as treated wood or durable plastic as well as metal and fiberglass. An outdoor ceiling fan can be either damp or wet rated and can withstand certain elements outdoors. They can be a great addition to your porch, terrace, deck, patio, sunroom and much more. The remote controlled ceiling fan is a more convenient style of ceiling fan that deviates from the pull cord style and the wall control style. The big advantage of this type of fan is that anyone can use it even if they can’t reach the pull cord due to lack of height. They don’t need a lot of work for electricians due to no wiring for a wall control. The only concern is that you may lose the remote control. The dual or triple head ceiling fan has two or more heads or motors and each motor has a set of blades that revolve to circulate air. They are great for adding more cooling power to a room and at the same time, adding attraction and uniqueness to any room due to their awesome design. They are rare to find so they can be a bit more expensive, and also because they have more than one motor to maintain. The large ceiling fan can be used on various purposes such as for decoration or for industrial use. Most of them have light fixtures as well. They can span up to 80 inches on each blade and they are suitable for really large areas other than for industrial or warehouse use. They can have style if they have many blades but if they only have 3 to 4 blades, they are mostly for industrial use. The flush mount or low ceiling fan, also called the hugger ceiling fan, is the kind of ceiling fan that is only suitable for those with 7-foot ceilings that aren’t capable of installing a downrod style ceiling fan. They sit closer to the ceiling so the problem is that they don’t produce a lot of air. They can fit in smaller homes, and if you just need a decent ceiling fan to muster enough air circulation then they are okay. Q: What kinds of criteria should I consider with the blades of the outdoor ceiling fan? Blade sizes can vary from 3 to 5 blades on the average, which is why you will find most industrial and outdoor ceiling fans with 3 blades or even just 4. On the other hand, you need to perfectly balance 3-bladed and 4-bladed ceiling fans to get their full effect. Blade replacements can vary from different manufacturers. You can get different designs in a set so you can choose whichever is suitable for your home or the current season. Blade color choices can also vary per manufacturer. Also do know that since most ceiling fans are hand crafted, they won’t be 100% blemish free during the manufacturing process – but that’s just proof that your ceiling fan is authentic! Q: What environmental factors and challenges will my outdoor fan need to face? Rain and water: you need to shield your fan’s motor from the rain and water splashes, if you are near the ocean or pool. Make sure your fan is wet rated in that case. On the other hand, if your location has a lot of wall to cover it then having a damp rated fan is okay. Consider the location of the fan in terms of getting wet and exposed to the bad weather. Air and wind: consider how much wind force will the ceiling fan will face. This will have an impact on how your ceiling fan can withstand high winds, especially for low downrod ceiling fans. Consider properly installing the ceiling fan when you decide on an area in your porch or patio and make sure everything is properly fastened so that it does not wobble or sway in high winds. Generated blowing power: do consider whether you want a ceiling fan to completely blow a lot of air or just add breeze to your patio or porch. Rust or corrosion: if you live near the ocean then corrosion is a big problem. You can choose from plastic ABS, stainless steel or those with rust proof coating. You should consider galvanized steel as well to make it rust resistant, especially if you live in highly humid areas such as near the sea or beach. Surrounding decor: the decor around the outdoor ceiling fan should greatly complement the style of your fan. Having a modern style fan in a traditional or native style patio might look a bit off, so you should look for one with traditional, rustic or at least transitional ceiling fan with treated wood blades to make it match your outdoor decor. Designs can vary from minimalist, traditional, modern to tropical. Size of your outdoor area: aside from natural factors, how your terrace, patio, porch or deck was built can affect the size of your ceiling fan and its blade span. Make sure you get a ceiling fan that is not too big and not too small. It should not be obtrusive with other decor in the outdoor setting or area. Q: What’s the difference between the clockwise and counterclockwise motion of a ceiling fan? • Clockwise movements are ideal for the winter, which creates the updraft that is needed to blow the air upwards to make sure that the ceiling fan can contribute to the heating process in your home or area. • Counterclockwise movements are ideal for the summer, which creates the downdraft that is needed to blow the air downwards to make sure that the ceiling fan can contribute to your A/C unit’s cooling process. Q: What are the possible things that prevent the ceiling fan from turning on? • Consider cleaning the fan first to check if any dust or debris that are getting in the way of your ceiling fan’s blades and the like. • The breaker box should be checked for any trip in the circuit, in which you can simply reset it. • Consider checking the wires for any loose connections in the circuit breaker. • If it has a wall switch, check for anything that is turned off and make sure it is turned on. • If your ceiling fan uses a pull chain then gently pull it when you use the wall switch. • For those with a reverse option, it might probably be in a neutral position, between clockwise and counterclockwise. Simply turn it to either of them to ensure it spins. Q: How do you properly install a ceiling fan along with down lights? Make sure the down lights are placed strategically. Each light should not be too far away from the ceiling fan and not too close to the ceiling fan so as not to obstruct the lights. It should be on the four corners between the edges of the room and the ceiling, not too far and not too close to the fan. Do consider the width of the down light when you turn it on, and make sure it is far off from the ceiling fan so that the fan’s blades do not interfere with the down light. It should be hung from a safe distance away from the light. A good distance from the tip of the blade to the down light could be 600 mm. If you can’t do anything about the width of the down light when you turn it on, you can install recessed down lights instead so you can angle it to another area. This is ideal for areas with a small room or living space to make sure the ceiling fan does not get in the way with the light. Q: Do you really need a ceiling fan light kit? • If you already have a lighting source in your home, such as down lights or recessed ceiling lights and other fixtures such as a chandelier then you might not need a ceiling fan light kit at all. • However, if you want to use the light kit as a supplementary lighting for your home or area, it will be okay, since ceiling fans are both decorative and functional. • The light kit and the light bulb should be bright enough if it is going to be the main lighting of the room or area. It should be at least 800 lumens if it is the primary light source. Q: What should be the pitch of the ceiling for it to be applicable for a slope or vaulted adapter? A: A vaulted adapter is a ceiling fan adapter that is applicable for those with a pitch of 30 to 32 degrees. If you live in a home or room that has a sloped ceiling or slanted design then you can go for a slope or vaulted adapter for mounting your ceiling fan. Q: How do I choose the pole or downrod length for my ceiling fan? Q: What are the different kinds of lighting that you can use for your ceiling fan’s light fixture? Halogen: they give off a warm lighting effect, which is suitable for those who want an antique style room or atmosphere. They are dimmable but the problem is that they heat up really fast and consume the most energy compared to other bulbs out there. They are also not very eco-friendly. CFL or Fluorescent: these bulbs are also not eco-friendly, but they are better than halogen at about 75% of savings in electricity. They are only ideal for dome lights with a case and not as a standalone bulb fixture. They are also not dimmable so they are not ideal for modern homes. Incandescent: these bulbs also give off a warm lighting and can also be dimmed like the halogen bulb. They also heat up and consume a lot of electricity so they are slowly being phased out, much like the halogen bulb. Some households still use them, however. LED: these are the most expensive of all, but they are the most eco-friendly and energy efficient so you can save more electricity each month. Some of these LED bulbs are dimmable and they are also easy to change. They also don’t give a bad impact to the environment when thrown away. A: Ceiling fans cool down people while A/C units cool down rooms. There is a big difference between the two when it comes down to cooling power. While you can use a thermostat to program your A/C unit for cooling, you can’t do the same for a ceiling fan, so you need to have some discipline in turning it off before you leave home. Q: What is the typical power consumption of a ceiling fan? Q: Should I get a ceiling fan over a stand fan? • You have a ceiling of at least 7 feet off the ground. • You want to save on you A/C and HVAC running costs all year round. • You need a fan that blows in all directions. • You need something portable and can be moved from room to room, a stand fan is your choice. • You have very low ceilings and ceiling fans are not applicable. • You don’t have extra budget for a ceiling fan and its installation. Q: How do electric fans benefit people, in general? • The air that is circulated is natural air, unlike with A/C units. • Fans are easier to clean than A/C units as well. • If you want something cheaper, then an electric fan is a good solution. • Zone cooling is possible with certain electric fans. • You can keep the air humid if your climate is dry if you choose an electric fan. • Most electric fans, like ceiling fans, are stylish and can add to home decor. Q: What are the different kinds of fans, other than a ceiling fan? • A box fan is a portable fan that is usually encased in a flat square and can be moved from room to room. • Window fans can be mounted onto your window much like with an A/C unit. • Oscillating fans are those that oscillate or their heads move and rotate for all-around cooling. • Exhaust fans are ideal for bathrooms and can be used for cooking as well. Q: How much energy does an average electric fan consume? Q: Should I run the ceiling fan with the A/C unit? A: Yes, running both the A/C and the fan simultaneously can have good effects in the summer and in the winter. It can help your A/C cool in the summer and also help your HVAC heat up the room in the winter with its reverse feature. 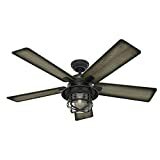 Overall, the Westinghouse 7200700 Comet is our best outdoor ceiling fan that is energy efficient, with weatherproof blades, can cool down up to 360 square feet and has a reversible feature.